Pla Tapian Tong Golden Female 'Mother Barbfish' Wealth Bringing Fish Amulet in Nuea Fa Badtr Almsbowl Lid Brass, from Olden Days World Famous Guru Master, Luang Por Jong, of Wat Na Tang Nork (Ayuttaya). This Amulet is estimated released around 2484 - 2488 BE during the Indochina Wars. Now a very rare ancient amulet of immense interest for devotees of Luang Por Jong, and especially those who seek to improve their commercial success, increasing wealth and prosperous living. This is the Dtua Mia female version, and empowered as a 'Tapian Tong' (golden barbfish). You can encase and wear this Animist Charm as an amulet, or You can hang the Pla Tapian in your place of business or home, to attract prosperity and increase auspicious living. If worn as an amulet, you can wear it at waist level, or keep it in your purse, pocket or wallet. If kept in the place of Business, you can hang it close to the door, above the cashtill, over your wares, or in the cashtill. Pla Tapian are extremely recommendable for Merchants, Salespersons and Business Owners, for their ability to increase good commerce and attract customers. One can see Pla Tapian Tong-Ngern in shops and places of business, market stalls and floating markets all over Thailand, which is a popular Animist Charm that has been used for many Centuries if not thousands of years. The Pla Tapian Tong (golden barbfish) was also made as Pla Tapian Ngern (silver barbfish), with both types also being made in male and female versions (Dtua Phu, Dtua Mia). 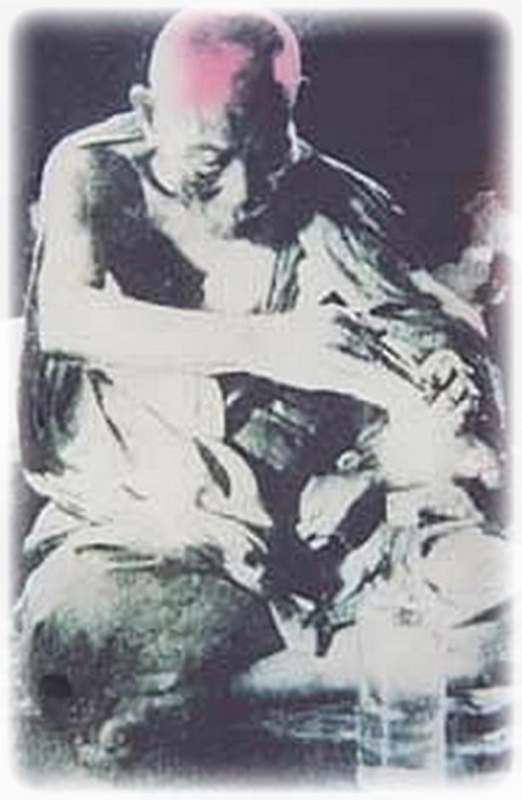 The Pla Tapian of Luang Por Jong is popularly collected in both types and both genders by devotees, who like to place them as pairs (male-Female/Golden/Silver). This is then known as 'Pla Tapian Koo'. When a devotee possesses both genders or types, they are then placed together as a double set composed of one 'Dtua Phu' male (classed as male gold or silver Tapian) and one 'Dtua Mia' female (classed as female, gold or silver Tapian). The word 'Ngern' means silver, and 'Tong' means gold, but, 'Ngern-Tong' in Thai, means 'Wealth'. And so the Pla Tapian Dtua Mia is powerful Maha Lap Maha Pokasap wealthy fortunes Magic, and is also Maha Sanaeh and Metta Mahaniyom Seductive Mercy Charm, which attracts customers, admirers, lovers, and turns enemies into friends. Prosperity and Mercy Charm are hence both powerful forces within the Pla Tapian amulet. He was a close friend of Luang Por Parn of Wat Bang Nom Kho, and of Luang Por Yim of Wat Jao Jet Nai. 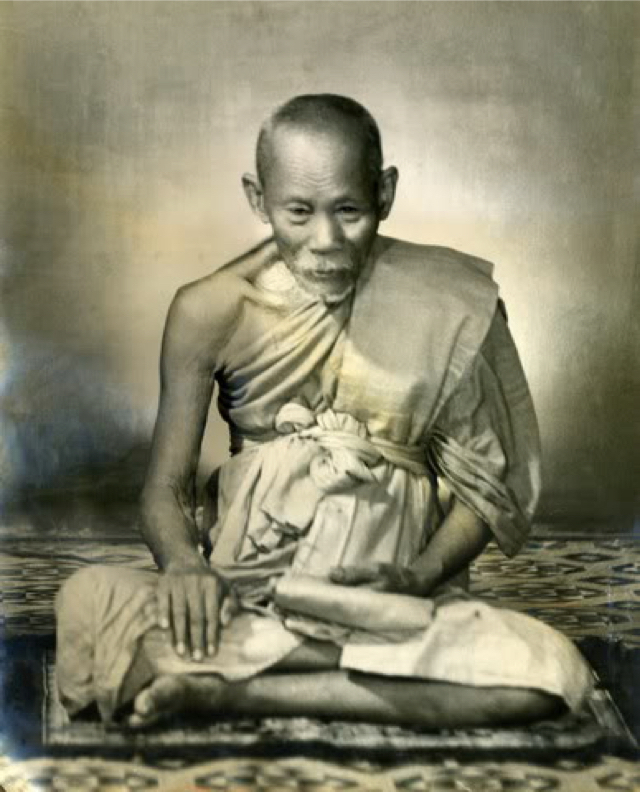 Luang Por Jong was a Gaeji Ajarn Guru Master Monk of the Ayuttaya Region, whose knowledge of Wicha Akom and certain specialised Wicha, was of great variety and who possessed some extremely rare abilities in the Wicha Saiyasart, which are most difficult to find in any Master of this Century. Known for his Kong Grapan Chadtri Klaew Klaad protective amulets handed out to soldiers during the Indochina Wars, his Pla Tapian Maha Pokasap Lap Kaa Khaay amulets are also renowned for their ability to instigate good commerce and prolific sales quotas with sales persons. Pla Tapian amulets have also become famous over the decades for their ability to bring people out of poverty and lead them to success. Very popular with small traders, market salespersons and also with large business establishments. Thai-Chinese Folk are also very reverent of the Pla Tapian Koo silver-goldfish Animist charm. Use to hang or or wear in your place of business and your pleasure haunts too, to attract customers, admirers, employers and helpfulness. 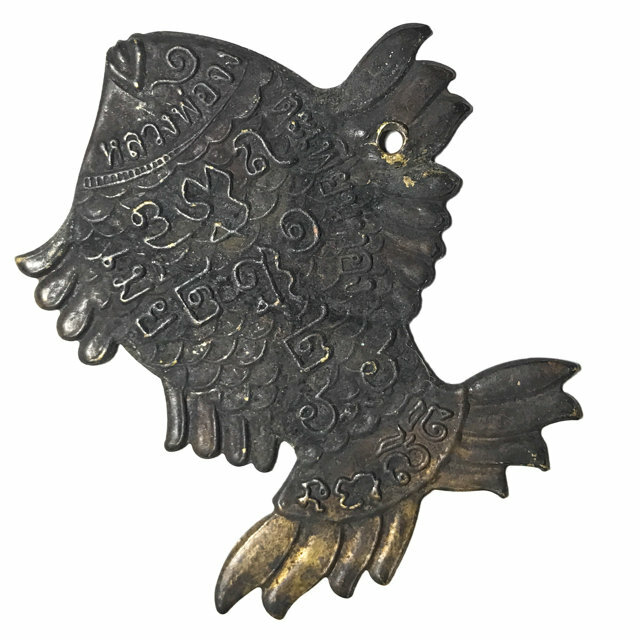 The Pla Tapian is a one sided convex piece of Sacred Brazen Artifact Metals smelted with Sacred Yantra Foils, and has Sacred Khom Agkhara and Numerology spells on the surface of the fish scales. Numerology is used for Astrological Influence as well as for Maha Lap Siang Choke Lottery winning Magic. One fish is named as the male, and the other as female, one as silver, the other as gold. Fulfilment in Love, Happiness, Popularity, and Prosperity is hence the Blessing which is received from either kind of Pla Tapian. This is a great and also very widespread Kata to be used for Metta Mahaniyom and Choke Laap purposes. It is Brahmin Origin and calls upon Lord Brahma and Lord Shiva to make all people wish to come and buy goods from you, as well as bring great fortunes luck and popularity to you. You should prepare the offerings necessary for Bucha to Pla Tapian, which is also an invoked Yant that invites the presence of the Tapian fish (a legendary Bodhisattva like entity from Vedic legend) to be present in the Yant. 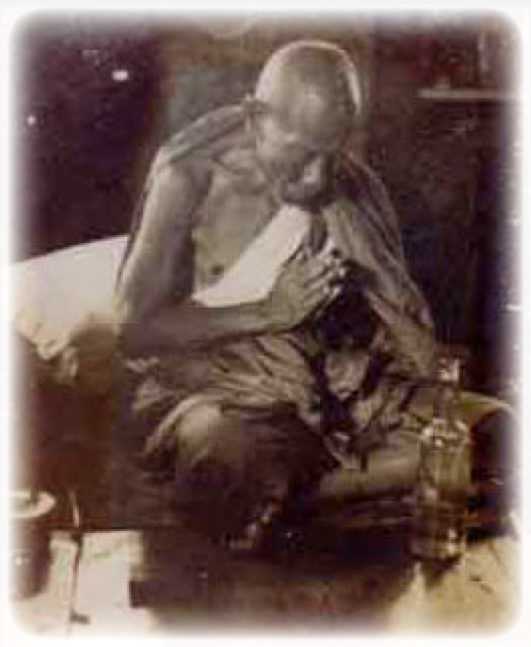 For this reason,it is necessary to make regular offerings of food and the like to the Pla Tapian. One candle of one Salerng in weight (four Salerng make one Baht so 3-4 Gram candle). One white Lotus flower or other white flowers.